The garment called "eyelet doublet" is not a form of ring armour, but an undergarment intended to be used under the actual armour. The eyelets are intended as ventilation holes. It was known as a "Schiessjoppe" in Germany. 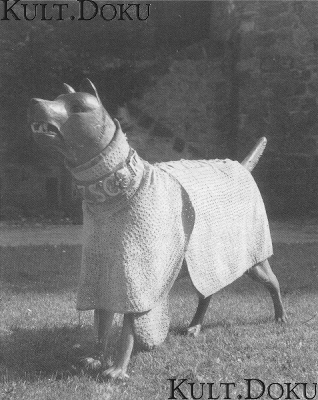 According to Sir John Smythe* the eyelet doublet most certainly was used as standalone armour. “Archers should wear either eyelet holed doublets that will resist the thrust of a sword or dagger and covered with some trim to the liking of the captain... or else jacks of mail quilted upon fustian." My question is whether the "eyelet doublet" and schiessjoppe are actually the same thing or whether one is armour and the other is an undergarment. Consider also the possibility that terminology could be confusing the matter too. Is a doublet "cutte full of hoolis" (referencing the above blog post) speaking of a doublet reinforced throughout with metal rings, or is this in reference to a pourpoint, which also has plenty of holes - i.e. eyelets - over which armor was secured. Embleton, in one of his books, refers to an eyelet doublet in which the eyes have been reinforced with a brass ring. I wonder if that could have further confused the previous generations of armor scholars. Now I am confused. I thought that the Schiessjoppe was an all-textile defense, definitely without brass eyelets. Is any European armor between the 12th and 16th centuries known to have had brass eyelets? As I remember, it is described both as a stand-alone defense and as something worn under plate. Perhaps it came in a heavier aketon/jack form and a lighter doublet of fence form? Mr Dongen, I don't mean to be fascetious, but how could Embletons book confuse PREVIOUS generations of scholars? Sorry, but that one made me laugh. Dan, definitely take wikipedia with a grain of salt. I have seen some mind-bogglingly ridiculous articles there. Is any European armor between the 12th and 16th centuries known to have had brass eyelets? As I remember, it is described both as a stand-alone defense and as something worn under plate. "Berner Nestelwams" - Swiss, End of 15th century. 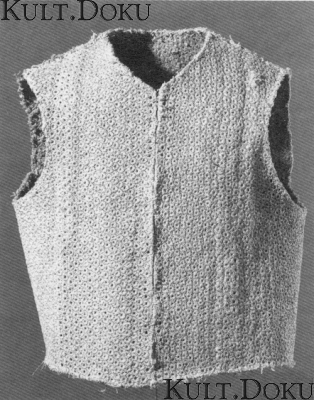 Armor made of linen. Four layers of cloth stitched together with a tight star-stitch (?). The so strenghtened fabric protected without the use of metal against injuries. To protect the skin from abrasion the front of the fabric was faced towards the body. It was found as a foundation garment in a 18th century woman's dress, but seems to be a lot older. Mr Dongen, I don't mean to be fascetious, but how could Embletons book confuse PREVIOUS generations of scholars? Sorry, but that one made me laugh. . He's probably not referring to Embleton's book, but to the "eyelet doublet in which the eyes have been reinforced with a brass ring." It's easy to see how such an example could have confused earlier scholars. Good one. Can someone provide a translation? Where was it found? Date it was used? Was it actually worn with that mail under it? len, the maille looks riveted in those photos its faint but you can just spot that telltale bulge that indicates where the rings edges have been flattened to provide a surface for the rivet. you have to lok REALLY closely though. and stare at it for a while. second says fragment (of) a leinenpanzers which, my net based translation yields linothorax consistantly by linothorax, im referring to the greek one, the german article for the fabled tube and yoke linothorax is titled leinenpanzer so there ya go. last one is clearly saying hentze for the right hand.. Thank you William, my zoom isn't the best. My first thought was that the strength of the threads would help hold the butted rings together but I guess not. the cloth thing and the chain shirt arnt the same item i dont think theyre attatched, though they might be.. I'm not asking whether they were attached. I'm asking whether the two items were actually worn by the same person at the same time. Or did some art historian think that they might look pretty together on the same display.